Dropsets have been popular among bodybuilders for more than half a century because of the way they enable lifters to go past what would otherwise be their point of failure. For some bodybuilders, however, the idea of trying to add muscle mass by reducing the load, even at the end of a set, just doesn’t compute. For them, there has to be a better way to extend their sets. With dropsets you go “beyond” by doing the exact same exercise, but reducing the weight to get more reps. With mechanical dropsets, the load stays the same, but the exercise changes slightly. Both techniques can help you get more out of your muscles, and both lead to greater muscle growth. Many lifters just find that the mechanical variety get them there faster. I’ve found that while most gym rats know about dropsets, far fewer are aware of this other kind of dropset. That’s too bad, because this kind of dropset helps add new size when nothing else seems to be working. This is such a simple superset, but it’s probably the most physically demanding of the 10 listed here. Front squats work the thighs a little differently than standard back squats. With the weight positioned in front of you, across your clavicles, you’re forced to maintain a more purely vertical stance—otherwise, the bar will roll off and drop in front of you. This vertical torso position puts more stress on your quads, forcing them to work harder. This set uses a very similar progression principle to the one with front squats and regular squats. Bringing your hand spacing in closer turns the bench press into an incredibly effective compound movement for the triceps. I recommend using a Smith machine for convenience here. Push out 8-10 good reps on the close-grip, squeezing your triceps for all they’re worth. 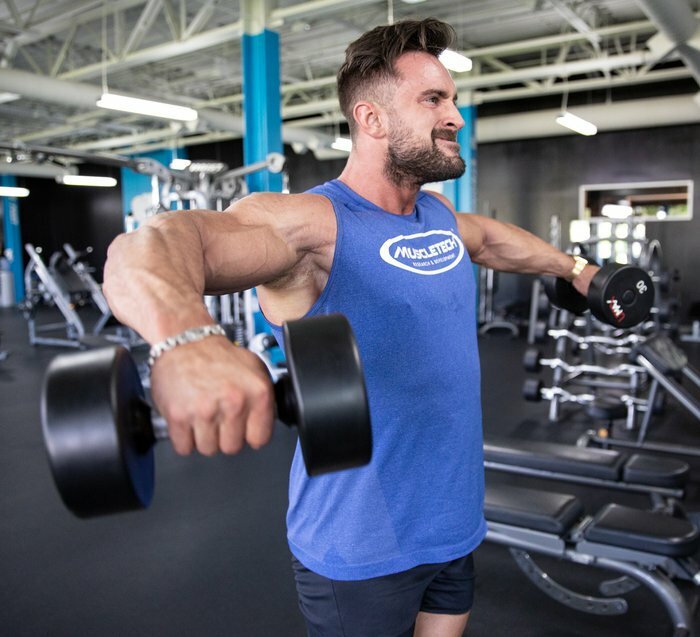 Lateral raises for the side delts are usually performed standing up, which often leads to some questionable form, as in the old “heave ho” of lifters using momentum and other muscle groups to raise the weights. To take the cheating out of this exercise and fully activate your medial deltoids, begin by doing lateral raises while seated. Do 10-12 reps of these, then stand up and do 10-12 more. By doubling down on these raises—but doing them as variations—you’re able to work your shoulders harder. That means more muscle fibers will be torn down and then rebuilt bigger and thicker during recovery. If there is any standing exercise where form is ignored more frequently than lateral raises, it’s the barbell curl. Lifters will rock, swing, and thrust their hips forward like Elvis to lift up a heavy weight. Sometimes these curls end up looking more like an Olympic clean and jerk. Back in the old days, they had “odd lift” competitions, and a staple was the strict curl. What made it “strict” was that the lifter’s back had to be flat against a wall or a post. That’s how you will start this mechanical dropset. Because you can’t sway or otherwise cheat, you won’t be able to use your normal curling weight. If you usually use 100 pounds, you should be able to manage 60-70 pounds for 10-12 reps. It may feel awkward, since you’ve probably never done curls this strictly before in a standing position. But that awkwardness is what it feels like to not cheat. Once you can’t get another rep, step away from the wall and continue for as many reps as possible. If you can’t get at least 8, take a few breaths and try again. As you’ll discover, these mechanical dropsets will really put a blowtorch burn to your biceps. Everybody wants bigger biceps, right? So here’s another killer duo to try for them. First, lie back on an incline bench and curl two dumbbells simultaneously. Get a full stretch at the bottom of every rep, and lift the dumbbells only to the point where they’re still under gravity’s pull. Going up all the way to the delts gives your biceps a resting point we don’t want. When you reach failure at about 10 reps, stand up and keep repping. For an added, if torturous, bonus, use alternating arms when you can’t get any more reps using both arms at once. Why not turn a common cheating style of form into an effective extended set for your lats? A lot of lifters will lean back on lat pull-downs so they can handle more weight, effectively turning the exercise into a hybrid movement somewhere between a vertical and a horizontal pull. Let’s rethink this by doing strict lat pull-downs, keeping your torso upright and pulling down to the clavicles in a straight vertical line. Begin with your torso in a perfectly upright position, elbows tucked in close to your body. During 10-12 reps, you should feel it mostly in your triceps. Once you’re close to failure, lean forward to bring your pecs and front delts to the party. 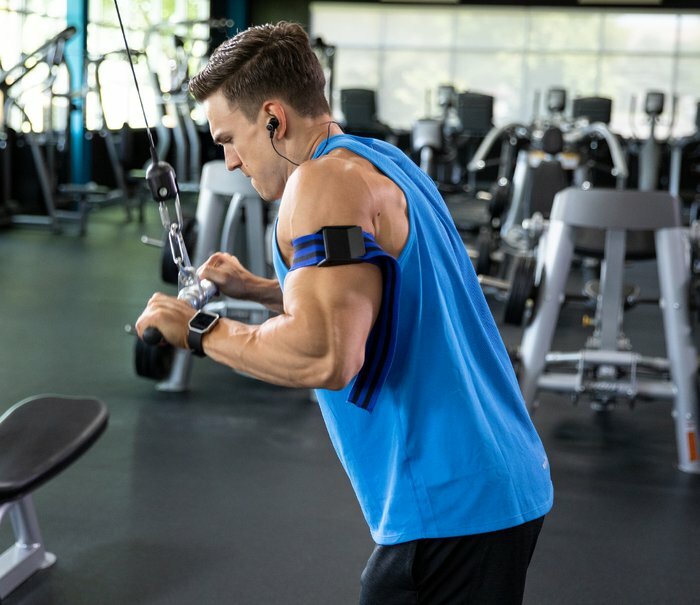 Because these two muscles are temporarily both fresher and stronger, they can help you drive your triceps into the ground, forcing them to work harder to keep up. You don’t see too many people doing reverse curls, which is a shame. It’s an excellent variation when you want to work the outer or long head of the biceps, the brachialis, and the forearm extensors. I suspect one reason some ego-driven lifters shy away from this exercise is that you can’t lift as much weight as with standard curls. Well, that’s what makes it the perfect start to this mechanical dropset. Once you squeeze out 10-12 reps of this reverse variation, flip over your hands and keep going for another 10-12 reps. Many people find an EZ-bar is better than dumbbells or barbells for this exercise, but it’s up to you. Whatever equipment you choose, your entire biceps and forearms should be tight, aching, and inflated with blood by this set’s end. Here’s one more mechanical dropset for your triceps. Reverse push-downs are done with an underhand grip. That reverse grip is one of the few ways to effectively target the triceps long head, which originates in the back of the armpit. As with reverse curls, you probably won’t be able to handle as much weight as you do with an overhand-grip push-down. Do both variations without any other bodily movement apart from your lower arms bending, and you’ll see what I mean. The difference grip position makes in this case is even more dramatic, so the same weight will probably be too light once you flip your hands over for regular triceps push-downs. No worries! You’re at a cable station with a weight stack, so just sink the pin down a few more holes and you’re good to go. This mechanical dropset will work both your lats and traps. Start off with bent-over barbell rows. Avoid the temptation to stand up too straight, which can turn these rows into something between a row and a shrug. You’ll be doing shrugs in a minute anyway. Work to keep your torso at an angle no higher than 45 degrees to the ground and pull toward your lower abs. Once you fail at about 10 reps, stand up straight, move directly into shrugs, and take them to failure. Get a full range of motion when you shrug, and don’t worry if your reps exceed the 10-12 range. The range of motion for shrugs is so short that higher reps are often more productive anyway. Use straps to secure your grip, because you’ll be holding on to a heavy bar for 20 or more reps here.